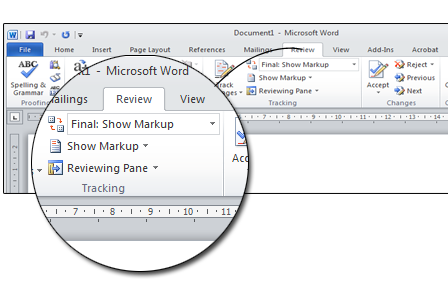 Microsoft Word Track Changes Function is a feature that allows to our proofreader to show you what kind of changes have been made to your proofread document. 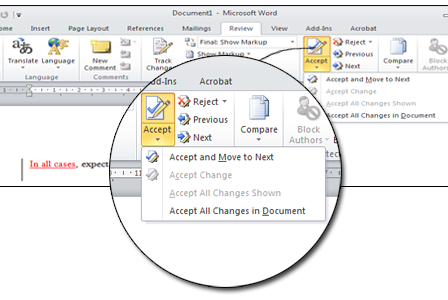 Track changes tool can be found on the Microsoft Word Reviewing tab. When track changes option is switched on, you should be able to see insertions and any formatting changes in your proofread document. These notes are for Windows Based Users. Any deleted text in the Microsoft Word document by our editors will turn up with a line through it, and any inserted text by will turn up underlined. These notes are for Mac users. 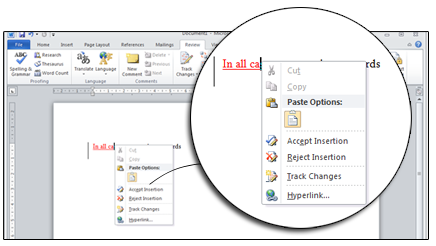 Any deleted text turn up on the right hand margin, and any inserted text turn up highlighted in the main document body. Original: Display document without any changes. We suggest you go through the whole proofread document and either accept or reject the changes which have been made by our proofreader at your document. Accept or reject the changes please click the right button of your mouse, over any of the red words, and a menu shows up. Then you can select to Accept or Reject the change. Accepted changes will integrate to your proofread document. Rejected changes will be removed from your proofread document. To accept all changes at once, click the Accept drop-down arrow, then select Accept All. Please note: "Reject All Changes" option will not remove comments done by proofreader. If your would like to delete all comments in the proofread document, select "Delete All Comments"
The proofreading services we give to our customers are as important as the editing that we do. Check out now all the benefits of using Proofreading .